HRC is sounding the alarm on reports of renewed persecution against LGBTQ Chechens. Approximately 40 people have been detained and two killed in a "new wave of persecution" that started at the end of 2018, according to a statement from the Russian LGBT Network. According to reports from the Russian LGBT Network, which has helped more than 140 people escape Chechnya since the crackdown began in 2017, law enforcement officers have detained individuals suspected of being LGBTQ in Argun, a city more than a dozen miles outside the Chechen capital. On April 1, 2017, Novaya Gazeta, a Russian independent media outlet, first broke the news that Chechen authorities had rounded up and detained in secret prisons more than 100 men who were suspected of being gay or bisexual. Chechen leaders have denied these accusations, going so far as to deny the very existence of LGBTQ people in Chechnya — a claim the Russian government astonishingly repeated. Nonetheless, there have been numerous verified reports of torture and at least three and possibly as many as 20 men have been killed. In June 2018, HRC joined a survivor of the brutal crackdown and Kimahli Powell, executive director of Rainbow Railroad, to meet with White House and State Department officials to address the ongoing crimes against humanity occurring in Chechnya and to share the survivor’s story. 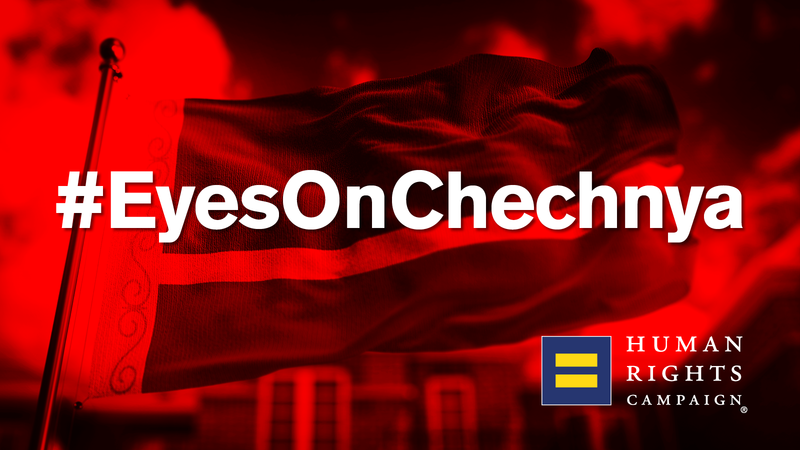 From working with Congress to activating our membership and raising up our voices together, HRC continues to send a message to the Trump administration and the world that we have our #EyesOnChechnya and these crimes against humanity must stop. “Human rights violators in Chechnya must be held accountable and be brought to justice,” Cobb said. “Lives are hanging in the balance." For more information about the situation in Chechnya and how you can help, click here.